Environmental education — Programs for all ages, throughout the four seasons. Land stewardship — Coordinating trail maintenance, managing invasive species removal, and propagating native plantings. Administration — Organizing work days, field trips, public nature programs, training sessions. Anyone interested in applying for the part-time position should submit an application by April 7. Update — A new naturalist has been selected. The Spring 2014 Newsletter is now available to read online. 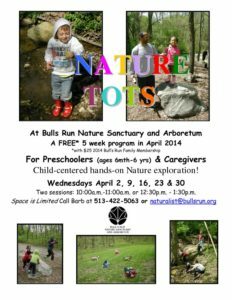 Another season of Nature Tots begins on April 2. Reserve your space now for a 5-week program of child-centered hands-on exploration for preschoolers (ages 6 months to 6 years) and caregivers. Choose Wednesdays from 10 to 11 or from 12:30 to 1:30. 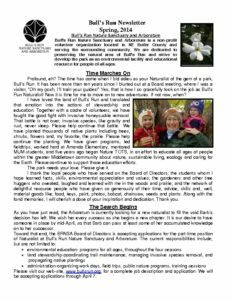 Register by sending an email to naturalist@bullsrun.org.